Aliens Hovering Above Earth in a Giant Ship? With all the talk about scientists possibly having identified an alien megastructure around a star some 1,500 light years from us, how frightening would it be to discover a ginormous structure hovering right over the Earth? That’s just what photographer and YouTuber “UFO Lou” says he captured on video. The footage shows a huge triangle as it fades into view and then fades back out again. The structure appears similar in shape to a black triangle UFO, except that it appears to be much larger and is glowing brightly. Shot in November of 2015, the video has sparked excitement and debate in the UFO community. Certainly, it meets the criteria for “UFO”: it is unidentified, and it certainly appears to be flying (or hovering). The object’s strange behavior, simply appearing out of thin air and then vanishing again, has been compared to a ship from the world of Star Trek using a cloaking device to hide from enemies. Although that level of technology is far out of reach for us, it’s not hard to imagine that an advanced civilization might develop and use cloaking to hide its presence when visiting another planet. The object in the video does not appear to move at all, leading naturally to speculation that we are not observing a ship but possibly an alien megastructure in a permanent position above the Earth. Strangely, the object appears to exhibit the same sort of dimming behavior that led scientists to identify star KIC 8462852 (AKA “Tabby’s Star”) as unusual and possibly having been surrounded by a structure created by extraterrestrials. 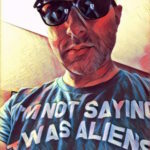 Paranormal investigator, UFO writer, and founder, Area51.org.